Practicing self care. It is hard to fit into a busy schedule and it seems we are all busy. Last fall I had an marketing intern named Micheal Rice. He was a very hard working intern and has since gone on to get a good job in NYC. One day Micheal brought in a can of flavored seltzer. We have a fridge at Ahlers Designs and always keep cold beverages for all of the staff. I personally have been know to consume great amounts of Coke Cola. Well I tried the seltzer and really liked it. Drinking seltzer is a better choice, it is part of my new self care program. Making little changes that make a big difference. Better self care for busy people. Now we always have seltzer on hand. It has no calories, no coloring, no sodium and it is very refreshing. 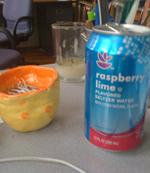 I am particularly fond of Stop & Shop Raspberry Lime Seltzer. It is always on my shopping list. I brought it home and my husband loves it too. Since he got his pacemaker we have to be very careful about his sodium intake. He is on a low sodium diet. Since we drink so much of it there are quite a few Stop and Shop seltzer cans have been accumulating. We will recycle them or make art. I hope to make an art project from them sometime soon. Similar to when I used reclaimed lumber and recycled cans to create the cherry blossoms awards. I keep thinking something in a Mermaid theme when I look at the blue can, but we will have to wait and see where inspiration takes me. I might have to see what other flavors have different colors of the cans. Stop and Shop is very supportive of women owned businesses. They are very committed to the supplier diversity initiative. Because they care, I care and I patronize their stores.